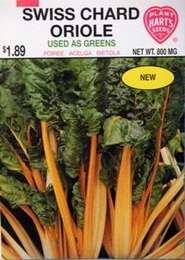 This brightly colored Swiss Chard can be used as an ornamental as well as a vegetable. Leaves are medium green with a bright orange stem. Has a milder flavor than other chards and is suitable for fresh salad greens as well as cooked like spinach. Swiss Chard replaces spinach during the hot summer months. Make cuttings of mature leaves about 1 inch above ground and new leaves will form allowing continuous harvest all season until frost.